To wit, Colorado Art Ranch isn’t just about the arts; it’s about creativity, and the intersection of individuals, domains, and fields of study. 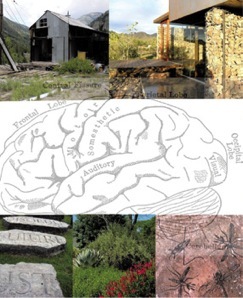 This itinerant organization hosted their first residency in 2007 for visual and literary artists from around the world in Salida, Colo. followed that same year by a second residency in Durango. They have returned each year to Salida, but have also hosted residencies in Steamboat Springs, Trinidad, at the Libre Community near Gardner, and the Carpenter Ranch near Hayden. Most residencies have been accompanied by an artposium focused on a theme inspired by the local landscape, history, and area concerns: water, transgender sexuality, agritourism, mapping, migration, dwellings, immigration, and this past summer: mine reclamation. the commissioners are considering whether or not to accept the donation from LKA International of the Ute-Ulay Mine. A donation that comes with environmental challenges. Let’s go back in time to August 27, 1871, when silver was first discover along Henson Creek in veins called the Ute and Ule (later changed to Ulay). It is worth noting that Ulay is what Chief Ouray of the Tabaguache Utes was called. The land where the silver was found belonged to the Ute Indians until Congress ratified the Brunot Agreement on April 29, 1874, and the Utes were moved to a reservation near present-day Montrose. In August that year, toll-road builder Enos Hotchkiss discovered gold nearby. Yet the area remained largely inaccessible until 1889 when the Denver & Rio Grande Railroad completed a narrow gauge line to Lake City. The railroad is long gone, though mining continues to shape current history. There are 50 inactive mines in Hinsdale County, which pose a slew of hazards and environmental problems, particularly when the current economic driver is outdoor recreation and tourism. So the idea of revitalizing this location and making it inhabitable again is appealing to some, but it also brought to light a schism in the community between pro and anti-mining interests. The Lake City Downtown Improvement and Revitalization Team (DIRT) and Colorado Art Ranch worked together to bring an interdisciplinary team to Lake City and listen to all voices involved. The team, following guidelines drawn from research on the collaborative process, came up with a three-phased approach focused on five priorities: sustainability; community; a balance of preservation and innovation; feasibility and flexibility; and public education. The residency culminated in a two-day artposium and presentation of the vision divided into three stages: 1) Immediate preservation and stabilization of the site; 2) Retrofitting the town site; and 3) Mill site expansion. experimental phyto-remediation using plants to draw heavy metals from the contaminated soil. It’s a process that hasn’t been scientifically proven to treat lead contamination, but scientists think it might be possible, proposing to use the site as a research center. A significant portion of the vision includes art and educational programming including creative signage, historic tours, text and images embedded throughout the site, sourced from poetry, diaries, maps, history and science. In fact, the mine site borders an existing BLM remediation site and a BLM engineering evaluation and cost analysis in 2006 estimated clean up costs for the Ute-Ulay site to be $2.1 million. Now that a vision has been realized, the first step in the process of making that vision reality is for the property to be transferred to the county. When that happens, Pound plans to propose that for the triage stage they raise $600,000. He will also recommend that Colorado Art Ranch be in charge of creative oversight “so that the vision doesn’t get lost in the translation.” He said the community needs money to create an overall plan. “What we did was called a vision. We’re not experts in mine reclamation or historical preservation,” he said. habitable, educational, artistic addition to Hinsdale County. Follow the development of this project at http://hardrockrevision.blogspot.com/. Time will tell if the subtle shift in imagining what is possible will lead to motion and transformation.